oute of self-publishing, the author must take a hands-on approach in marketing their book. Fiction by the DIY Book Festival. 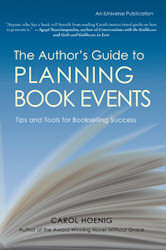 Her book THE AUTHOR’S GUIDE TO PLANNING BOOK EVENTS was named finalist by USA Book and Reader Views and given the Gold medal by ForeWord Magazine for Book of the Year in the category of writing. Carol’s essays, articles, book reviews and short stories appear in a wide number of publications. Carol blogs for The Huffington Post covering politics, culture, the publishing industry and the writing life. This entry was posted in Alan E. Smith, Events, Marketing. Bookmark the permalink.